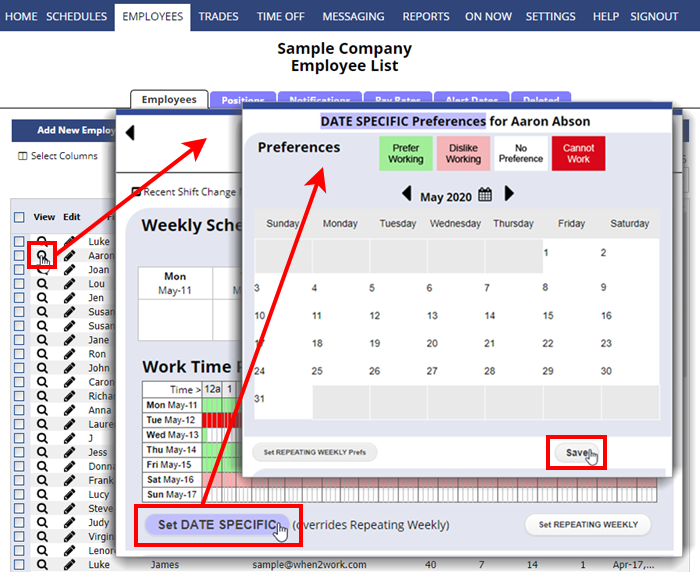 Note that employee Work Time Preferences do not change any already assigned shifts – they can just be used by AutoFill when you automatically assign shifts in the future. You can use the Analyze feature at any time to compare how the assigned shifts compare to the current work time preferences. Also, the preferences can be used when finding replacements for shifts. Note that there currently is not a way to “mass clear” one or more employees’ preferences. 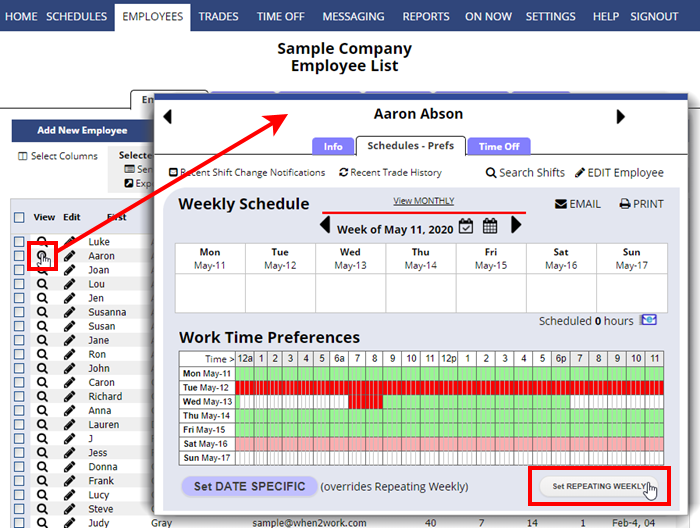 When you click any shift, the Shift Change window will show a list of employees who are available to work that shift. Employees who have set that time to “prefer to work” are listed first so that you will know the best employees to consider for that shift. Click the Set REPEATING WEEKLY button to open the preferences window (These are the normal daily preferences for the employee and can be set down to 15 minutes for each day of the week). Note each day shows Midnight to Midnight. To clear the times, click the white paint roller button and then “paint” over the times you would like to change by pressing the left mouse button and holding until you want to stop painting. Click a day name to change that whole day to that color. You can save the preferences on the screen as a “Preference Template” to be used for other employees. 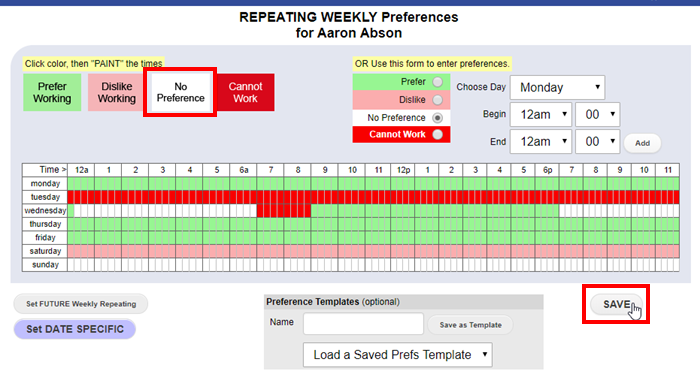 For example, you can quickly add Cannot Work hours for minor employees by loading that preference template into each employee’s REPEATING Weekly Preferences grid. After setting the normal repeating preferences for an employee, you can then set any dates that have different preferences using the Set DATE SPECIFIC Preferences button. For this specific date, you can paint preference times and choose to repeat for a number of weeks.(Ex. to also set these preferences for the following Wed. choose Repeat for 2 weeks). You also can open this window and click the COPY Preferences button and then choose another date and use the PASTE Preferences button to apply those preferences to the other date.